OBEY currently has 7 official maps for its one gamemode. Due to placement of safe terrain, the Robo, Drop zone, and other points of interest, some maps may be more or less difficult to subvert on. For this reason the "Tyranny Index" has been developed, a scale which gives a general idea of the overall properties of a map. The Tyranny index is a very new scale so the values may not be accurate. ZoneOne was the first map ever created. It features a Drop Zone that is fairly close to the Feed Box, but has plenty of water nearby to hide in and is close to the right wall which has offsets that provide cover. There is a very densely-covered area down mid-west and north-western sections of the map, allowing bunnies a relatively safe approach down this route if the Robo is not paying particular attention. The path between the Drop Zone and the Feed Box is not only almost completely free of any sort of dense or hard cover, but is also concrete tiled. All Bunny spawns are along the top wall. The Power Plant is just north of the Drop Zone, but as there is very sparse cover, it may be quite difficult for Bunnies to reach it unspotted. ZoneFar is a considerable modification of zoneOne. 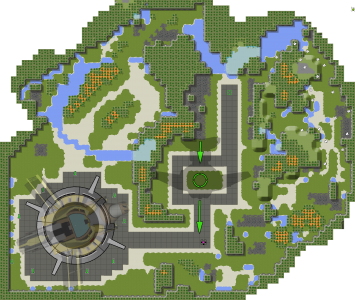 It retains the northernmost, western and southernmost features, but has its entire center and western areas reworked. Unlike its sister variant, Cornered, zoneFar has two large ponds that serve as hiding places: one to the west of the Drop Zone, and one almost directly along the path to the Feed Box. Surrounding the Feed Box though, is a complete absence of cover. The heavily forested plateau overlooking the patches of water a distance east of the Drop Zone holds the Power Plant, although there are only two ramps up onto the cliff, and both are in good view of Robosaru. Cornered is a minor modification of zoneFar. The shortest travel path from the Drop Zone to the Feed Box, however, now runs behind the hill at the center of the map, giving Bunnies an opportunity to drop their collar and hide, or to conceal corpses here. 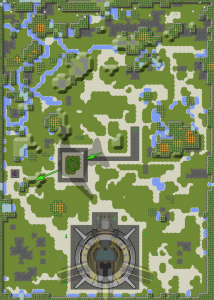 Directly east of the Feed Box is also a large amount of terrain, and the Drop Zone is closer to the hilly region surrounding its west, making this map debatably easier for Bunnies to escape compared to zoneFar. 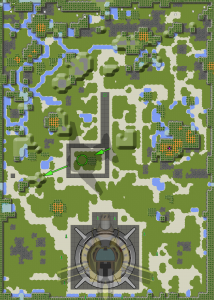 The Power Plant is a short dash west of the Drop Zone, and although this is the opposite direction to where obedient bunnies should be moving, the path is semi-concealed by a hill. Doublel is the only official map with two Feed Boxes: one is dangerously close to the Robosaru's entrance, and the other is far from Robosaru. The player in Robosaru must decide whether they allow Bunnies to place items in the closest Box, risking Bunnies making a quick and easy subversion should the Robosaru player look away, or let Bunnies travel to the far Box, making it easy for them to successfully deter from the path into cover. The Power Plant is on the far side of the Drop Zone, which although is close, is in the opposite direction to both the Feed Boxes. All the Bunny spawns are in a cluster on the far corner of the map. Airstrip is a map with very little hard cover and elevation. However, much of the map's surface is covered in water. The bunnies spawn near a very heavily watered area in the north and make their way southwest towards Robosaru, which only has a frontal approach. The direct approach is along a river, which forms a choke point due to the scarce plantation around it. The longer approach around the east and south side of the map has substantially more cover, but is considerably more time consuming to traverse. The Drop Zone and Feed Box are quite a distance from Robosaru, and although this allows easy management of Bunnies who are on the concrete, Bunnies are still able to jam items onto the top of the inaccessible cliff just south of the Drop Zone, and the shadow caused by the Dropship's wing allows an easy premeditated escape over the eastern hill during drops. The path leading to Robosaru has the Power Plant installed, bordered by two bodies of water. ozone has a massive, impassable cliff running down the centre of the map, forcing subverting bunnies to either take the frontal, direct path in the South, or to take the back route at the North side of the map, accessible via a large area of water near the Feed Box. Just east of the Feed Box is a back route bordered by impassable cliffs that, although does not take the Bunnies to Robosaru, provides a relatively large safezone from Robosaru and can be used to stash items for later use. The cliff that runs along the Drop Zone and near the Feed Box cannot be climbed onto, and thus can very easily be used to permanently stash items the Bunnies do not wish to deliver. The Power Plant is installed out in plain view, on the southern, frontal approach to Robosaru. It is in the completely opposite direction from the Drop Zone than the Feed Box. ozone was originally created under the name "zoneZero"
tributary was originally created under the name "zoneFive"
This page was last modified on 25 July 2015, at 18:08. This page has been accessed 53,198 times.